The 20-hour concert features Hindustani classical ragas that are usually left out of regular concerts due to restrictions on what time of the day they are meant to be sung. It was well past 4:30 am by the time Niladri Kumar, the young Sitar virtuoso of the Senia-Maihar Gharana, concluded his show-stopper piece at the 8 Prahar concert last year. After a 20-hour sensory overload, one would’ve expected the audience to beat a somnolent retreat. Instead, rapturous demands for an encore and loud shouts of ‘once more’ drowned out the applause as conceivably the longest classical music concert in the world drew to a close. Goaded by the charged air, Durga Jasraj of Art & Artistes and & Shashi Vyas of Pancham Nishad, Mumbai’s foremost concert impresarios, are back with the fourth edition of 8 Prahar this December. 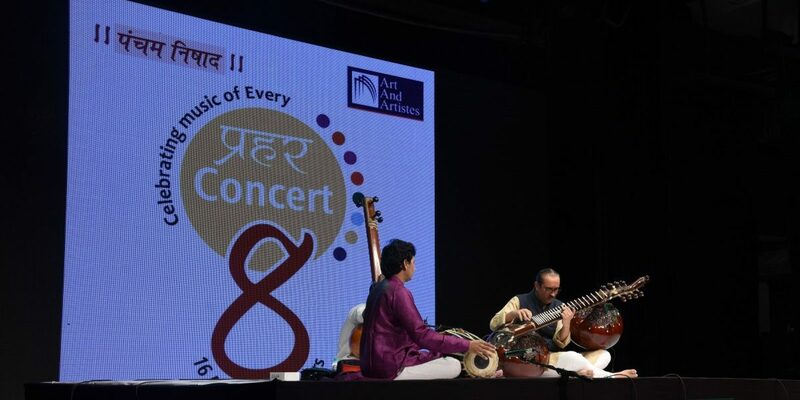 The duo joined forces back in 2015 to bring the thematic conference to Mumbai to showcase the diverse treasure of ragas that lay unheard on the regular concert circuit owing to restrictions of the consecrated time tradition. A distinctive, and rather prescriptive feature of Hindustani classical music classifies ragas by the time of day they are meant to be sung, broken into eight prahars of 3 hours each. The factors that determine this time association are broadly based on the mood (rasa) a raga is meant to evoke during a particular time of the day. This, in turn, is contingent upon the prominence given to one or more notes on the melodic scale. Ragas with a flat 2nd (re) & flat 6th (dha), for instance, are expectedly sung around dawn, the 1st prahar when dark meets day and the mind’s disposition is still quiet and reflective. As the first rays of the sun stream in, those that employ the re & dha in its natural position come into fray. Afternoon constructs usually do away with the re & dha as the flat 3rd (ga) & flat 7th (ni) gain prominence, reflecting the blazing intensity of noon. Several other more complex decrees such the placement of the sonant & consonant notes in the octave determine the time theory, which, though controversial and hotly contested, is still widely adhered to by performing artists on the arena. Now, in its fourth year 8 Prahar has swiftly become a sought-after calendar event for both artists & aficionados. Attracting a ticket-buying crowd of over 2000, a number that only one closed door venue in Mumbai, the Shanmukhananda Auditorium, can accommodate, Jasraj claims that people from places like Haridwar, Dehradun, Kerala and Goa to the US, UK and Ghana, including many others, descend upon Mumbai “by appointment” to listen to the staggering array of A-listers that gather under one roof. Top musicians, she says, are even ready to adjust their prior schedules to make time available for the annual event. In an era when even the rambling all-nighters with legacy appeal tether on the brink of survival – Kolkata’s Doverlane Music Conference, Jalandhar’s Hariballabh Festival of Classical Music and Varanasi’s Sankat Mochan Sangeet Samaroh being the exceptional few that endure – pulling off a day-and-night spectacle of the scale of 8 Prahar is a daunting organisational feat, to say the least. Unlike in other concerts where artists can make spur-of-the-moment decisions on what to present, the ragas in 8 Prahar are carefully curated and pre-assigned to the artistes months in advance. 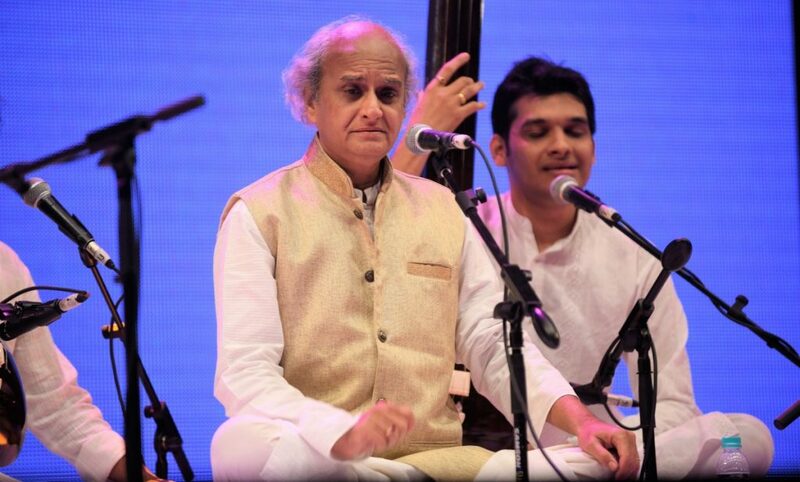 “We give the them the time of their recital & three ragas to choose from,” says Vyas. A great deal of effort goes in ensuring that there are no repetitions, the performer sticks to the script and there is a general distinction & balance of vocal & instrumental recitals through the day. Lighter genres such as thumri, bhajan, natyasangeet & ghazal which have become the staple concluding pieces at khayal concerts, are explicitly disallowed, particularly during the morning sessions. And the established hierarchy of performing as per seniority, a matter of legendary ego clashes among capricious artists in the past, has also been done away with. 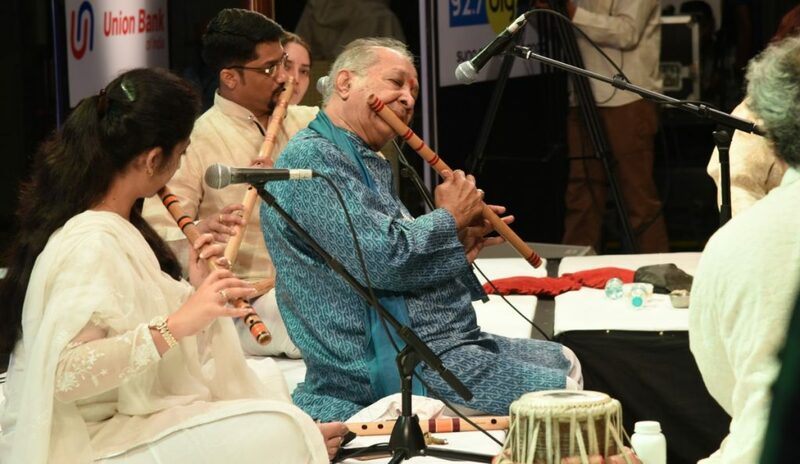 Last year, Pandit Jasraj’s performance was preceded by the young flutist Ronu Muzumdar and followed by the even younger Sabir Khan on Sarangi. “A new performer could well be sandwiched between two veterans at 8 Prahar, or vice versa” says Jasraj, who believes that this practice gives artistes the necessary nudge to up their game for their recital. However, like other classical art forms, sustained patronage for the event remains the single-most pressing challenge for the organisers. Ticket sales only make up about 20-25% of revenue, and with Bollywood and Western music having swallowed the market, corporate funding for an extravaganza of this nature, barring from public sector undertakings, is extremely hard to come by. The pressures of commerce are, unfortunately, harbingers of musical gimmickry. In a bid to attract newer audiences and expand its appeal, 8 Prahar this year will experiment with the ‘jugalbandi only’ format, where musicians use different instruments or styles to collaborate on duets. It’s a considerable risk to the quality that the event has maintained all these years. Even the most consummate musicians find it hard to produce aesthetically congruent music through such alliances, which more often than not end up as displays of technical one-upmanship & rhythmic flourish. With a two-thousand strong audience, the perils of playing to the gallery are only likely to be amplified. But never-before-heard collaborations by artist pairs such as Sanjeev Abhyankar and Shahid Parvez, and Shujat Khan and Rashid Khan, may well produce a worthwhile musical alchemy. They are arriving in town two days in advance to rehearse for their recital. The usually star-studded event will also present lesser-known but compelling emergent talent this year. These include Shashwati Mandal, a Gwalior Gharana exponent widely regarded for her dexterous hold on ‘tappa‘ gayaki, and violinist Milind Raikar, a disciple of D.K. Datar and Kishori Amonkar. This is a prudent decision given the heat organisers have been rightly facing for crowding out fine artistic talent at the cost of parading a small clutch of commercially viable superstar musicians. 8 Prahar will begin at 6 am on December 8 at the Shanmukhananda Chandresekandra Saraswathi Auditorium in Sion, Mumbai and end at 4:30 am on December 9. 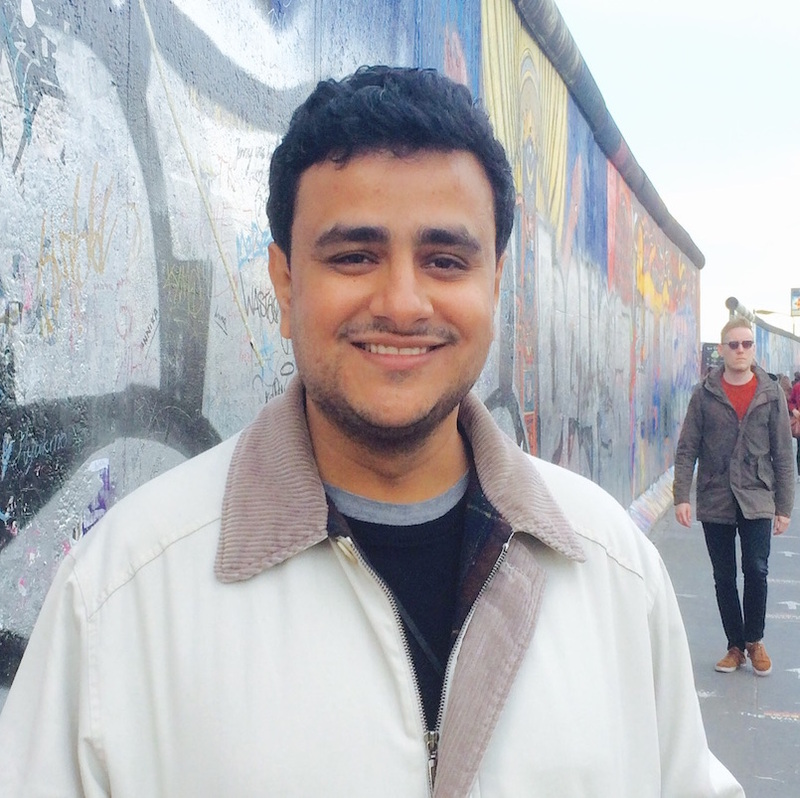 Nikhil Inamdar is a freelance journalist.